Scarves are such good addition to the wardrobe. Really adds attitude. Fab!!!! Love your look, esp your tropical shirt! So sweet! I love fun scarves and this one is adorable! Such a great summer look! This is too cute!!!! I am obsessing over this scarf! Banana leaf scarfs are like my obsession! Well basically anything banana leaf is! 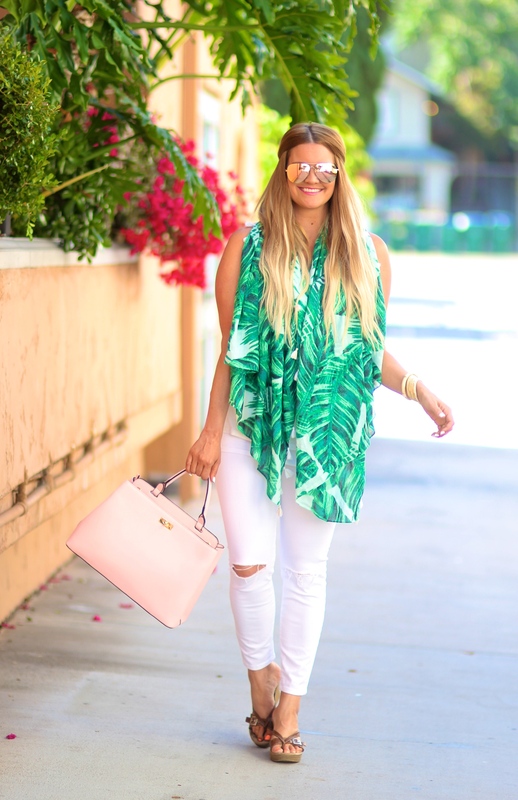 I absolutely love this palm-print scarf! Especially paired with the all white ensemble! OMG I love this scarf, so beautiful! 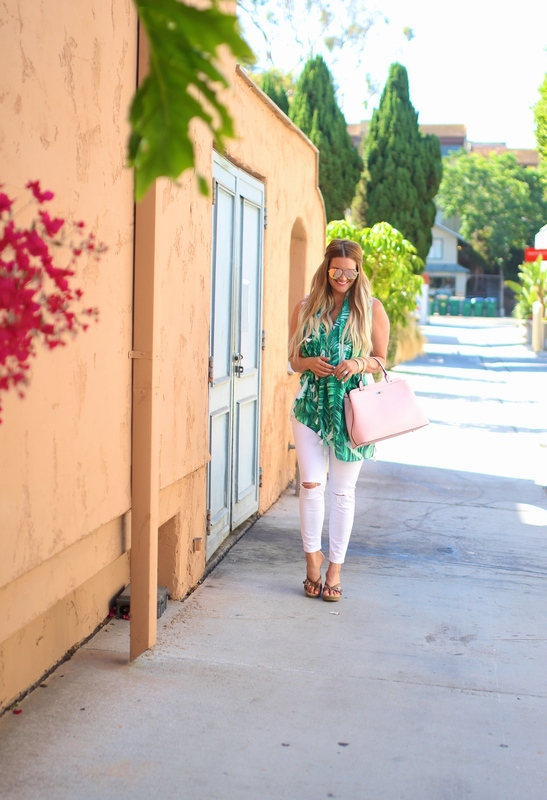 This look is Summer style perfection! That palm print scarf/sarong is fabulous! Love this look! Love this simple way of adding colour to a white on white outfit. Beautiful look- also..it seems so colourful in your world, love your locations! Pretty Palm Perfect!! You look adorable I just love that you paired it with a pink bag! I hope your Monday is off to a marvelous start you Stunning lady!! Loving the palm print! A scarf is such a fun way to do it. Such a cute outfit! Loving the palm print on you! What a stunning scarf! At first glance I thought it was a top! Absolutely beautiful! Have a great day gorgeous! I love the palm print! It’s so fun! I love palm print everything! Love this look on you. Thanks for sharing and Happy Monday! We are on the same style page! I have a palm print sarong/scarf that I am packing for Sicily this week 🙂 Love the detail on yours. What a great tropical background for your photos, too! You look so summer chic! I love that vibrant scarf, it looks so good with your all white outfit! Beautiful as always! Love that you made this sarong into a scarf! What a fun palm print and I love it with the all white. Have a great start to the week, Shauna! I Love!! This pattern is a new favorite and it pops with this look! Actually, I love love love!! You look so pretty in the palm print! I am loving the pop of color that it brings to your outfit. I’m totaly in love foirm your summer style! Gorgeous scarf! I need it!! In love with this scarf! So fun and tropical! I love that scarf/sarong! 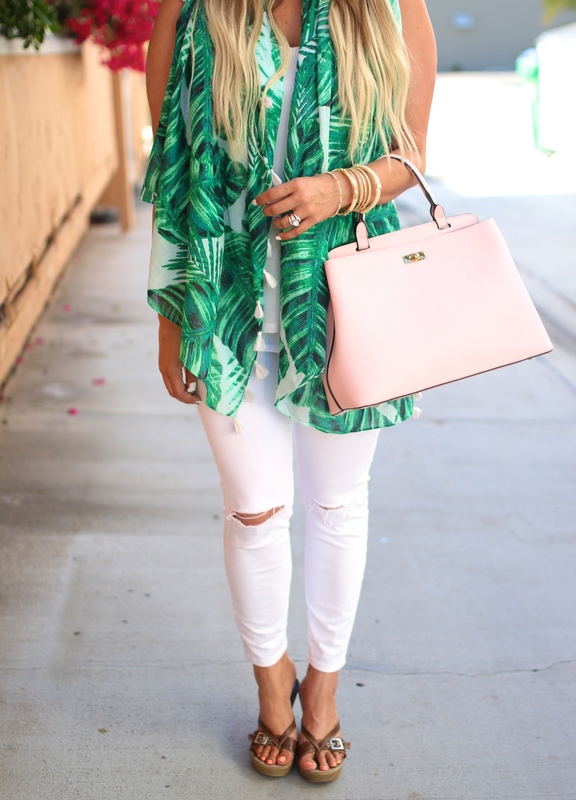 I’ve been obsessing with palm print everything so I love this and love how you styled it! 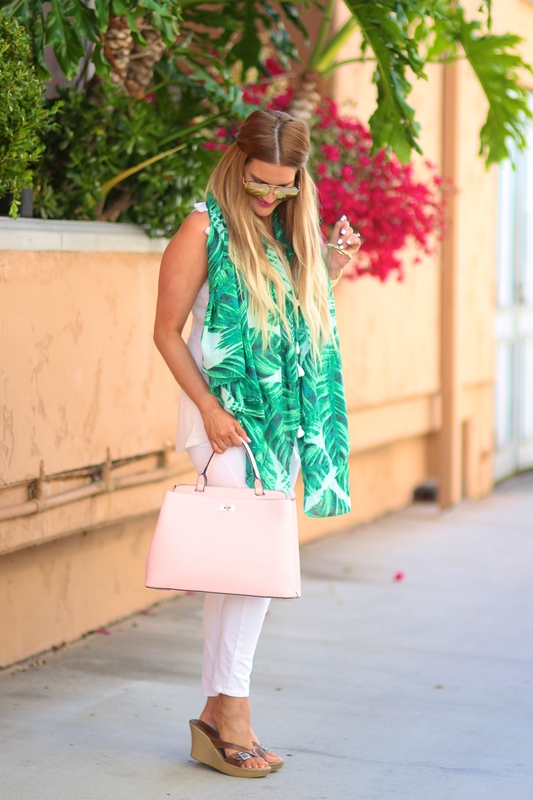 This tropical outfit is so perfect- the the blush bag is a great finishing touch! You look wonderful and that scarf is perfect for your outfit! Such a cute scarf! I love how you paired it with all white. I love that palm print is appearing so much in clothing and accessories this summer. I am all about this cheery palm print scarf/sarong! And I am loving it with your sunnies! OMG!! I really love this!!! Palm prints are always a must for me!! And I love the way you stayed it!! That scarf is beautiful! Loving the blush bag too! You just showed us that a little goes a long way!! Neutral colors then you throw in a patterned scarf, VOILA! Perfection is accomplished! – Amy J.
I just love how lux this look is. The palm print on white could not be any more perfect. Looking fabulous! Such a beautiful shade of green! It adds the perfect pop of color to your summer outfit! love this color combo hon the green scarf is gorg!. you look an palm princess-love it! This scarf is so on point! I love that you kept the rest of your outfit neutral, it really makes the scarf stand out like it deserves! That makes it even better! I love a nice bold print in something as fun and summery as palms! Totally love your scarf! So perfect and summery. I would have never known the difference. Looks like a scarf to me. I love the palm print with the all white. Gorgeous outfit! Lovely scarf and palm print. You look amazing Shauna! super cute outfit! loving that handbag! so chic! You look gorgeous love! The color suits you perfectly! Oh wow that’s a sarong ! It’s fun to wear wardrobe staples in different ways! I love tucking my short dresses in a skirt…. Anyways I love how u styled your outfit! Love the palm print of the sarong. 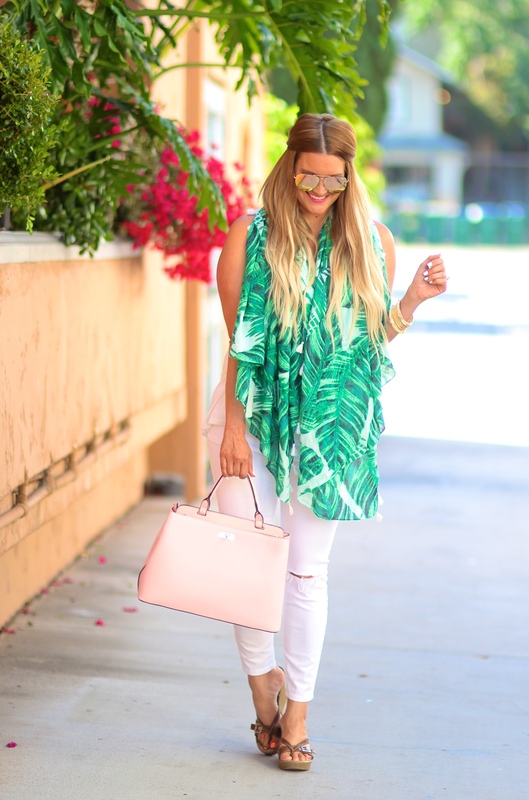 That palm print scarf is everything! So gorgeous! It will make any outfit standout! Love how you styled it! Love this palm print! I’m thinking of a palm print manicure this weekend!